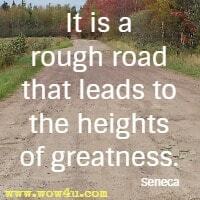 Let these greatness quotes answer the question of, what is great. Is it material possessions, is it fame, is it job position, is it helping others, is it self first. What does greatness mean, are you destined for greatness. Consider the quotes and thoughts of others on this. As human beings it is our general belief that successful people are special and that they are born destined for greatness. It is just too difficult to comprehend that the main things that separates those people from us is not anything particularly special; it is simply their mindset and habits. P. G.Manifold, Perseverance Is A Skill and You Need To Master It!